I’m *really* excited about today’s post. If I wasn’t ready before I’m definitely ready now. I’m welcoming Spring/Summer 2013 with open arms swinging with my candy colored bags! I do not have any bright/colourful handbags and I have been searching… But that search ended last week when I came across the Vince Camute Perf Drawstring Tote in Blue Tint. I can’t even give you a link because it’s sold out in all three colours on the website! However, Nordstrom carries the other two colours :). 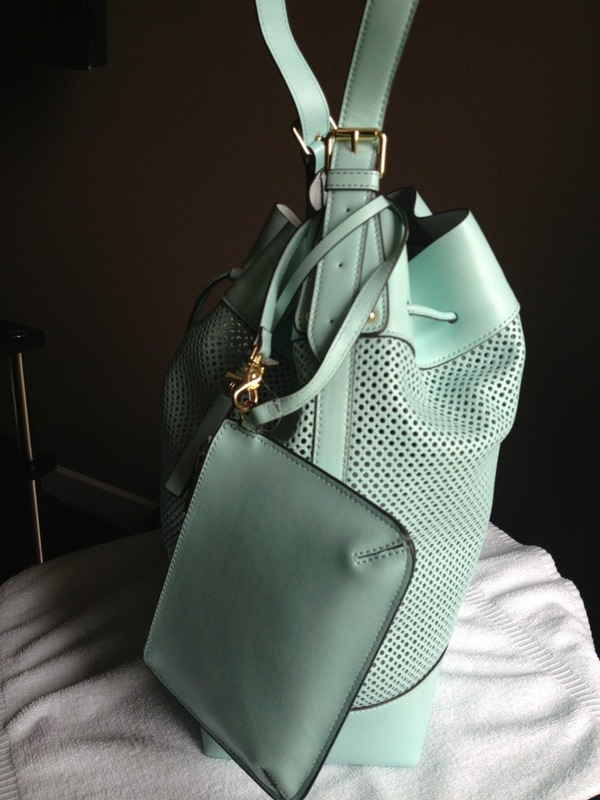 I first saw the bag in the sand color and I went to Vince Camuto’s website to see if any other colours were available. It was there I found the Blue Tint. I went to Nordstrom to check out the size of it and get a feel of the bag. I wanted the Blue Tint but after seeing the Sand I wanted that one too! But I didn’t get it. I went back home and oogled at the blue again trying to figure out if it’ll be just as nice as it looks on the website, darker or lighter and if I’ll end up returning it for the sand. However, I went to Retail Me Not to see if the website had any coupons and I was in luck – 30% OFF!!!! So I ordered the blue tint and I’d had the sand put on hold in Nordstrom just in case. It’s Thursday. My bag came today and the one on hold in Nordstrom was put back out since Monday and I’m not sure if I want it anymore. 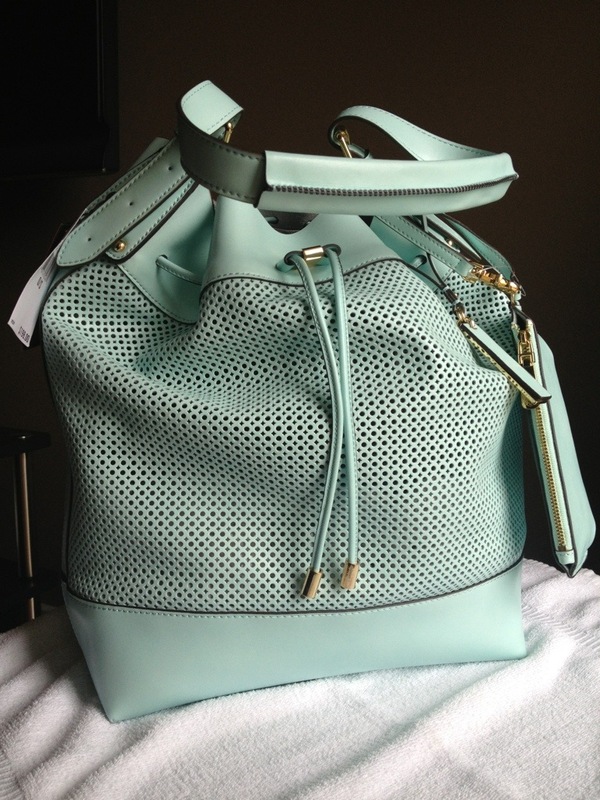 This colour is sooo dreamy and it just makes the bag even more to die for! I can’t wait to use it! I love that it comes with a detachable wristlet as well! The bag is not lined so I think I will need to keep personal stuff in cosmetic bags or something. It also has a dust bag. It’s the perfect size. Not too big or too small, I can definitely travel with this bag if necessary. I couldn’t be more pleased and excited with this bag. Mint is such a fun colour. I was also in the market for a clutch that I could use to travel with. Something summery, a bit of colour that would go with any and everything. It also had to have a classic style, while not being too big or too small. This would be my chosen clutch for vacations. My husband always thinks I’m online window shopping but I keep telling him I’m doing research. Yes, I research before I buy. 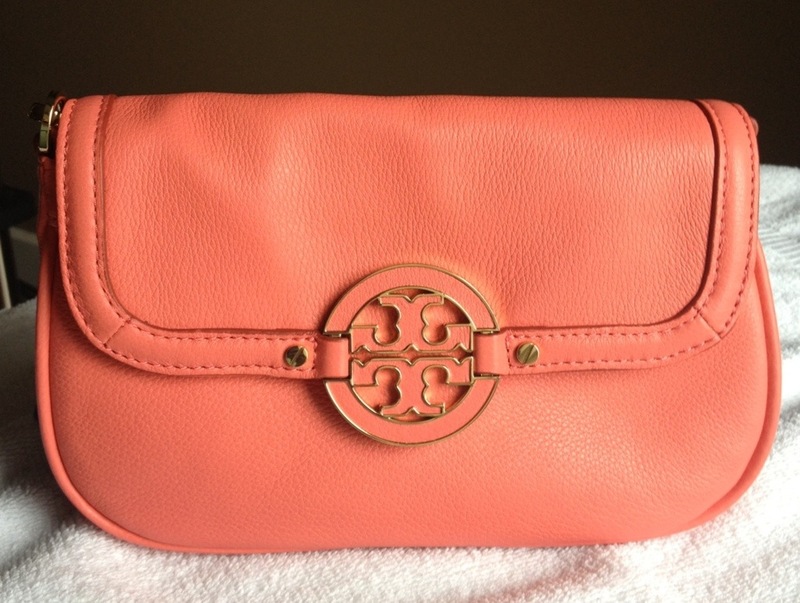 So after doing some research and getting a bit of input from him this is what I bought: The Tory Burch Amanda Classic Crossbody in Strawberry. I don’t even know where to begin… this bag is just everything for me! Coral is one of my favourite colours to wear and now I have an accessory in it. I love wearing pastels and this colour just complements them so well. I’m thinking of eventually getting the black or tan colors as I don’t have a staple black clutch. I haven’t found the perfect black one yet, more extensive research needs to be done on that one ;). You can detach the straps from the bag and it also has a pocket on the inside as well as two card slots. Again, I’m excited to wear this and I will be sure to post pictures whenever I do. 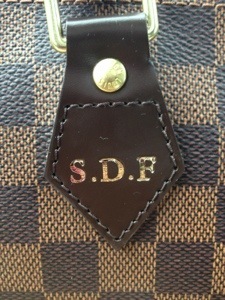 While we’re on the topic of bags, I finally took my Speedy to get my initials hot stamped on to it. I’d done this for a card holder I got for my husband for our anniversary last year (he loves having his stuff monogrammed) and I figured I’d just take this to be done while I went to Tory Burch. So happy! It’s marked for life! If I get a daughter and pass it down to her, she can add her initials as well next to it :). Hope you enjoyed this post! Feel free to subscribe to keep up with me :). Those bags are gorgeous. I am over here trying not to covet. sigh.